a musical combination to fit every budget & location. We can help plan your musical event. Receptions, concerts and recitals, religious services, memorials, openings and corporate functions are among the many events for which we can provide music. 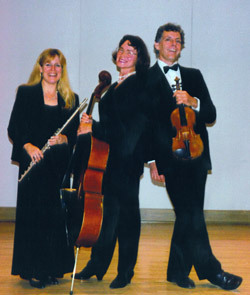 We have an extensive collection of standard classical works and popular tunes, and we're always ready to arrange music. Classic Consort's professional musicians can advise you regarding the best combination of instruments and musical selections for your event. works well indoors or outside. includes a wide variety of musical styles. The classic, beautiful sound.A string quartet consists of two violins, viola and cello. This combination produces complete, four part harmony with an extensive repertoire in a wide variety of musical styles. Trumpet can be added to any ensemble to enhance a processional or recessional. We can also create an arrangement of your special song. "THANK YOU for playing so wonderfully at our wedding last week. The music you played -- from the pre-ceremony through the recessional -- set the perfect tone for our wedding. We could not have asked for a better accompaniment and so appreciate the time that you put into helping us create such a beautiful program."